Flory is a night time fairy and, as the name implies, she sleeps in the day and comes out at night. Her magical powers get much stronger in the midnight hour. But when tragedy strikes and she loses the use of her wings, she is forced to figure out a new strategy to avoid predators and other dangers she could flit away from before her injury. She decides to become a daytime fairy and it really takes some getting used to. She finds it difficult to adjust to the light and all the happenings that take place around her. She meets a squirrel whom she “stings” in order that he will not eat her, and as the story unfolds they become “friends”. But really Flory is just using the squirrel to meet her own needs. She definitely has a poor outlook on life and the things around her. She will in the end discover a new way to look at life when faced with a difficult situation. If the story does not grab your attention right away, but I think it will, the illustrations will draw you in. Even the pictures themselves appear magical and I found myself staring at them and smiling as I thought about this tiny little creature fending for herself in the world. Whether or not you believe in them, fairy’s are fascinating and I am sure kids, I would guess grade 5 and up, will be as enthralled as I was. 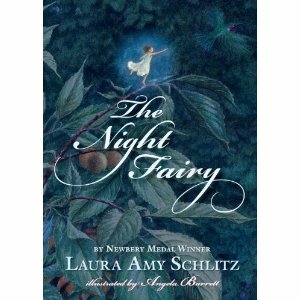 Thanks to Ms. Schlitz for writing such a magical novel. Wonderful book for my niece, can’t wait to see the illustrations!